I'm not going to lie, I was super drunk when I ate this bowl of ramen. I had been out in Shinjuku until god knows when and had drank a not small amount of liquor. However, I still had enough of my senses about me to realize that 1. for the sake of the next morning, it would probably be a good idea to get as much starch into my stomach as possible, and 2. that this would be a perfect opportunity to knock another shop off the list. Tenka Ippin (The Best Under Heaven) is almost right next door to RYOMA, and is a very different bowl of noodles. Tenka Ippin (or "Tenka Ichi" to its substantial cult of devotees) is a fairly big national chain with its honten (original store) in Kyoto. Apparently it started from a single portable cart in 1971 that only sold 11 bowls the first day and went on to grow into a hugely successful corporation. Although the vibe is in general a bit fast-foody, the ramen is totally decent, and very unique. When I lived in Kyoto five or six years ago, I seem to remember going to Tenka Ichi a fair amount, maybe because I had a friend who always argued for it when the idea of eating ramen came up, or maybe because it was close to the gate of Doshisha University, where I spent a fair amount of time. At that time, I thought it was basically just regular (if fairly cheap and thus attractive to students) ramen, and didn't realize that the yellow soup and chickeny flavor were Kyoto ramen trademarks. 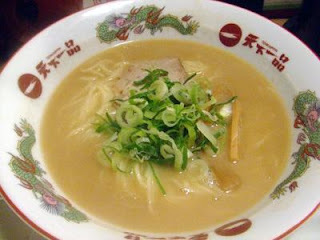 The primary choice is between assari (light or thin broth) and kotteri (thick or heavy broth). While the assari is essentially not too different from your average bowl of ramen, the kotteri is a beast all its own, with the soup so thick that it is almost like a thick sauce, gravy, or gritty curry. The official website calls it healthy, but I have my doubts about that. Toppings are almost non-existent, save for a few slivers of bamboo and some onions. That night, as always, I went with the kotteri and shoveled it down like there was no tomorrow. Actually, if I hadn't filled my stomach with something to absorb the booze, there may not have been a tomorrow, so the metaphor is perhaps an apt one. I seem to recall always having had a fairly mediocre opinion of Tenka Ichi, but that night it hit the spot. However, I remembered upon finishing my bowl that one of the other reasons I never liked Tenka Ichi that much is because the helping of noodles and volume of soup seems somehow smaller than other places, though it could just be an illusion from the shape of the bowl. I don't think I'll ever be one of the devoted followers that the Tenka Ichi chain has amassed nationwide, but the desire to eat Tenka Ichi is a specific kind of desire that can only be fulfilled by one thing, like wanting to hear a certain song, or drinking a cold Pepsi on a hot day. Hey! just wondering if you had an idea as to what an asian restaurant in the states (e.g. PA)might call tenkaippin. I would like to find something as similar as possible to the real thing to try; it wouldn't be called "tenkappin" or include the terms "assari" or "kotteri" (well, since I have checked..) JW!